In SolidWorks command manager, there are many existing tabs for you to use, like Features, Sketch, Surfaces … and so on. It allows us to find our feature easily. Sometimes, I found that it still take my time to find the feature which I want to use especially those I often use. For example, I use Solid-Surface Hybrid modeling all the time. So, those tabs I often use are feature, sketch and Surface. When I want to sketch, I had to go to Sketch tab. When I want to use Extrude, I had to go to Features tab. When I want to use offset surface, I had to go to the Surface tab. It became not so user friendly to me. To make my work easy, I customize my own command manager tab. Without editing the existing tabs, I create a new tab and put in all the features that I often use. Click on the add new tab and select Empty Tab. 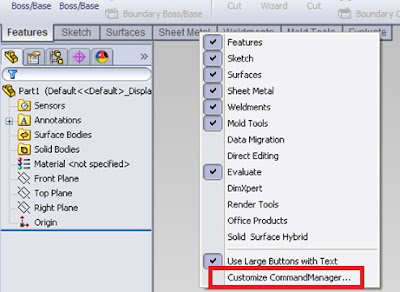 Then go to command and you can start to drag the feature into the new tab you just created.